Website design and Web Development combines the disciplines of creative design with the technical skills of coding, programming, and user-experience optimization; all in an effort to present a polished website to the end-user. By combining the elements of layout, color, graphics, fonts, and content; a website presents a cohesive image of your brand to the public. Image and brand identity matter to businesses, non-profits, religious organizations, and thought leaders; and designing an attractive website is foundational to developing that identity. With modern, cutting-edge designs, Fusion Group USA specializes in creating custom website design and website development that are focused on accomplishing our client’s goals. If you already have a website, we take a close look to see what is currently working and what can be improved. From creative direction to technical specifications, we improve on what works and redesign what doesn’t. Although mobile-specific sites have existed for several years now, the industry standard is responsive design – websites that shift their layout automatically based on the viewer’s screen size. 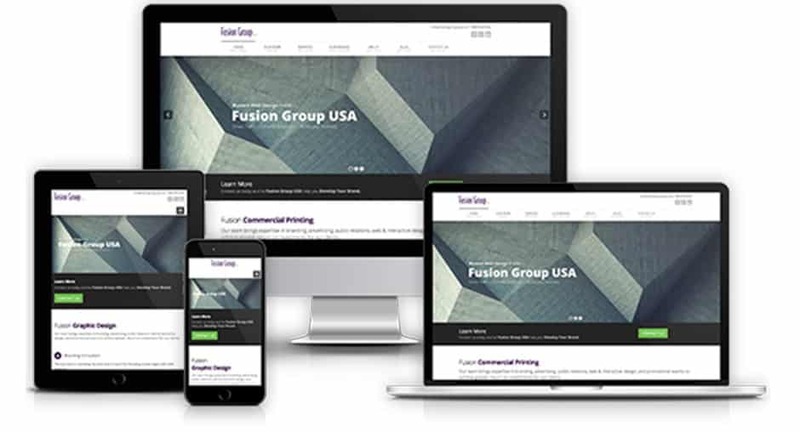 Fusion Group USA always designs responsive websites that look good on any screen. Before any site gets built, we consider the purpose of the website to plan a structure that works for the end-user. Making intuitive and easy to use websites is one of our primary goals. 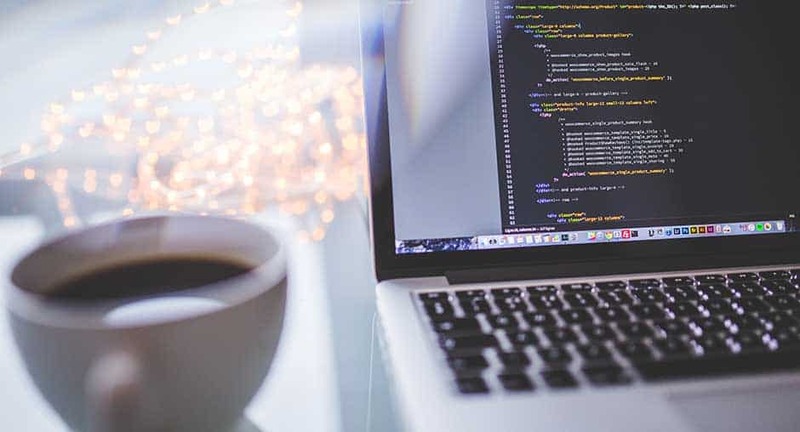 Our website designers and developers are seasoned experts in various coding and programming languages – ensuring that all Fusion Group USA designed sites are fast, reliable, and attractive. We make websites that are compatible across devices and browsers, optimized for search engine indexing, and tailored to the end-user. To stay on top of changes in the market, our team of website designers and developers relentlessly track the analytical data of our sites. The in-depth analysis of visitor data helps us to build and maintain sites that consistently reach the target audience and stay on top of the competition. By following users as they are navigating around the site – seeing what they click on and how much time they spend on each page, we can improve site navigation and optimize popular content. Slow load times hurt the user experience and SEO. By keeping a close eye on load speeds across various browsers and devices, we can ensure that customers are not bouncing from your site because of slow speeds. Keeping load times down also has the benefit of increasing SEO rankings – as it increases average time-on-page and sends positive signals to the search engines. By seeing how users are finding a site, we can optimize for keywords that are already driving traffic and build on targeted keywords that are underperforming. Understanding how users are accessing a site is critical to further developing a successful website. This data also provides valuable insights into social media, advertising, and SEO efforts. Tracking the age, gender, and location of site visitors gives valuable information into the target audience. Knowing who is accessing your site will help to shape the creative vision, keyword usage, and content strategy for driving further success. By monitoring and tracking this data, our agency can build successful websites that keep up with new developments in the market. We have the information and the flexibility to change with customer’s needs and updates to search engine algorithms, and this data also provides us with the tools to prove the return on our client’s investment – showing how the website is performing with the targeted audience. 100% Site ownership after initial payment term. This is YOUR site & content to with as you please. Monthly Marketing Meeting & Strategy Session with In-House Marketing Manager. Custom Developed CRM Software Built into Your Site. Do I own my site, domain and all content? YES! 100%. After your final payment has been received the copyright and ownership is transferred to you for you to do with as you please. Are your websites built for search engines? YES, YES, YES! Every type of site, whether it is a 5 page local pet store or a 100 page enterprise are built with search engine standards in mind. We invest heavily in software, education and tools to ensure every website we build is successful! Over 90% of the sites we have built are on the first page in their direct market for their top keywords, without the need for any additional SEO optimization services. Every market and every industry is different and some will see better organic results than others, but we will walk you through the process and arm you with realistic expectations before you pay us a dime! The bottom line is we are not a “Website Mill” and we do not approach ANY project with a one size fit all method, our agency only succeeds when our valued clients do. Is my site going to be a template like most designers use? ABSOLUTELY NOT! We build your site 100% to your specifications! How long has Fusion Group been around? Fusion Group USA was incorporated in Arizona in 2001 and opened our second office location in Colorado in 2008. After the site is built do I have to stay with Fusion? ABSOLUTELY NOT, but we will make it worth your while to stay. Once your final payment has been received you are free to take the site to any host you want, although our hosting service is pretty amazing and comes with much more than just hosting. But if you wish in the end to go somewhere else are free to host anywhere you would like and we won’t cause you even the littlest fuss. Will you train me how to blog and operate the site? ABSOLUTELY! We we will teach you anything you want to learn, however, if you are hosting with us we will make any and all changes you need to the site complimentary so you can focus on running your business. Get in touch to learn more! What if I need to edit or change content, pictures, etc. on my site? Well you are in luck! As long as you are hosting your site with us we will edit your site free of charge! Edits take place within 1-2 days, unless you have an emergency edit, then those are completed within 1-4 business hours. And you can make as many changes as you need! Will I hear from you after the site is built or do you just disappear? ABSOLUTELY 100% NO WAY! We are with you as long as you want us. After your site is live you will be assigned to an in-house service administrator and they will check in with you monthly/quarterly or as you request. We will also program your information into our automated system for monthly reminders like edits needed, questions, comments, concerns, etc. ( you can always opt out). Fusion Group USA offers a full range of website design and website development services. We can build totally new sites from the ground up – providing unparalleled creative control and customization options or rebuild an existing site to upgrade the look, performance, and SEO results. We offer contemporary solutions for ecommerce that combine beautiful websites with secure and intuitive shopping carts, payment options, and customer data tracking. We know that every business is unique and has unique needs – that’s why we build all our sites from the ground-up for a custom, tailored look that matches your image and needs. Our mission is to provide websites that drive traffic, convert customers, and build your business. We accomplish this through the combination of creative concepts with the latest in cutting-edge technology and coding. Our website design team builds high-impact, user-friendly websites that are ready to grow and evolve with the market – offering solutions that reflect your personality and style, while working tirelessly to grow your business.